WHO cited 4293 total cases and 2296 deaths as of September 8th. Dividing 2296 by 4293 gives proportion of fatal cases (PFC) of 53%. At first glance, it appears that 53% of Ebola cases are fatal. Historically, all Ebola cases since 1976 (the fist case) are 80-85% fatal. 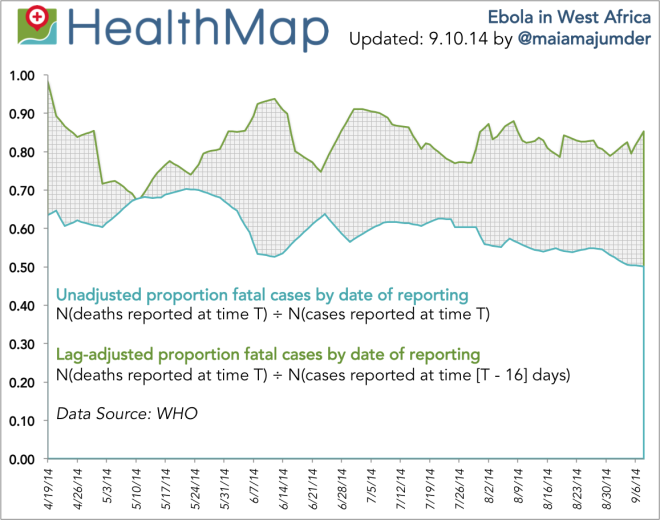 But what it really means is that only 53% of Ebola cases have died as of September 8th. We have no way of knowing whether all the people who were still hospitalized as of September 8th will survive the disease. The 2296 deaths reported as of September 8th were likely reported as cases prior to August 23rd, 2014. Adjusting PFC for this lag-time gives us a much better approximation of case fatality rate (CFR). This value is usually only available when the outbreak ends. The real fatality rate for this 2014 ebola outbreak (the CFR) is 82%, not 53% as most news outlets have been reporting. This discrepancy has been exploited by conspiracy theory bloggers to claim that this outbreak is some new exotic secret super death virus created by USA for everything from population control to eugenics to getting a military base in Liberia. In the past week (Sep 3 to 10th), as I scanned all wordpress blogs tagged ‘ebola’ I have noticed that the number of conspiracy blog posts have doubled while the number of first hand accounts and field worker reports of the epidemic have dropped off. Last night I scanned about 100 posts and did not find a single account from an eye witness that was not posted as part of some news article. The raw data coming in is too sparse. As a writer, I am starving for anything real and unfiltered that I can draw upon to write a fictionalization of the events. But there is nothing to draw upon.